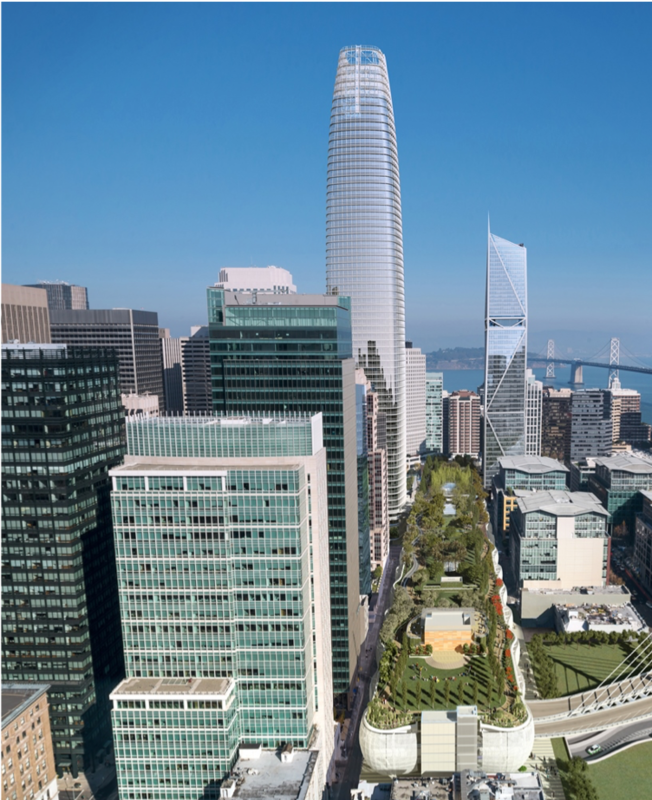 During the week of February 4, 2019 the City and County of San Francisco is bringing an estimated USD152 million of 30-year green bonds to market to fund a portion of the Salesforce Transit Center. A Preliminary Official Statement (POS) which details the “AA+” Fitch rated Special Tax Bonds, Series 2019A and Series 2019B, has been made available to investors. The proceeds of the Series 2019B (Federally Taxable - Green Bonds) will be used to finance green projects as part of the development of the Salesforce Transit Center, the new regional transportation hub. This new facility is expected to achieve at least a LEED Silver certification due to its sustainable design features, and its related facilities, including the Salesforce Park and Train Box. The 5.4 acre park located on the Salesforce Transit Center’s roof, is a 1,400-foot long elevated public park that includes an outdoor amphitheatre, gardens, trails, open grass, children’s play space, a restaurant, and a café. The Salesforce Park serves as a 'green roof' or 'living' roof for the Salesforce Transit Center, providing shade to ground-level sidewalks and a biological habitat for flora and fauna and public open space. The park also acts as an insulator for interior spaces by moderating heat in warm weather and retaining heat during cool weather. As a biological organism itself, the park helps to capture and filter exhaust in the area and helps to improve the air quality of the neighborhood. The Train Box was built to accommodate the planned Downtown Rail Extension to extend Caltrain tracks from their current terminus to the Salesforce Transit Center. The bottom level will be the Train Station Platform and have three passenger platforms that will accommodate six train tracks for Caltrain and the California High Speed Rail. The lower concourse, will serve as the passenger connection between the Transit Center and the Train Station Platform and will include retail, ticketing, and bike storage. The 2019B Bonds have been Certified by Climate Bonds under the Low Carbon Land Transport Criteria of the Climate Bonds Standard which demonstrates to investors that the project financed is expected to contribute to a sufficiently stringent emissions reduction trajectory. This represents the second issuance of green financing for the Salesforce Transit Center. Stifel is the senior managing underwriter for the Bonds, with RBC Capital Markets, LLC and Siebert Cisneros Shank & Co., LLC serving as co-managers. In September 2018 San Francisco hosted the Global Climate Action Summit (GCAS), where the Global Green Bond Partnership (GGBP) was launched with founding members including World Bank, IFC, EIB, Climate Bonds Initiative, Ceres, ICLEI, GCoM and LEDS GP. The basic role of the GGBP is to support efforts of sub-national entities such as cities, states, countries, corporations and private companies, and financial institutions to accelerate the issuance of green bonds. GGBP members will also seek to engage with and provide technical assistance to Signatories of the Green Bond Pledge, supporting the development process around inaugural green issuance. San Francisco was one of the inaugural issuer signatories of the Green Bond Pledge, committing to establishing a green bond strategy to finance infrastructure and capital projects, supporting climate resilience and the reduction of greenhouse gas emissions. California has consistently been at the top of the US muni green bond league tables with San Francisco, SFPUC, SF BART and ​Los Angeles MTA (LA MTA) all contributing via Climate Bonds Certified bonds. SFPUC, SF BART and LA MTA have also adopted the streamlined Programmatic Certification process for large and repeat green issuers. As more cities take sub-national leadership roles, climate action will increasingly be connected to debt capital raising plans and infrastructure investment. The City and County of San Francisco is already amongst the leaders; backing the Green Bond Pledge and issuing multiple green bonds.